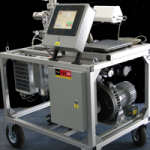 We can custom design vacuum systems that incorporate analytical equipment, such as RGA’s, add high vacuum pumping technology such as turbo molecular pumps and provide an easy to use system control that integrates all of the individual components. All of our vacuum systems are built around our core understanding of oil-free rough vacuum pumps. Contact us to talk more about your vacuum system needs and we will work with you to understand how to best meet those needs and create a competitive proposal for the system that best fits your requirements.